The Snail Bay at the east-coast of the peninsula owes its name to a rare population of asps which live there. The hot springs near the bay are the most popular destination on Svatoy Nos. Usually tourists use boats to go there, for no other connection exists. For hikers there is a scenic tour along the shore of Lake Baikal leading to the springs. The many sandy bays invite for swimming and relaxing. A lot of Russian tourists use the summer holidays for camping there, though. Monachovo is located in a bay where many boats offer their services. So visitors can arrange for transportation to the Snail Bay or to the Ushkani Islands. The GBT-trail starts at the northern end. After a steep ascent the way leads through a forest towards a fork where you can either follow the Dangerous Slope route or the Recommended route. The dangerous trail offers panoramic views over Lake Baikal and is walkable without any problems for experienced hikers. The recommended trail leads over the steep coast through a forest. About 40 minutes later both trails meet again in the picturesque fishing village of Katun. After leaving the village and the cape, follow the road for about 50 m away from the lake to a place to the right where the path leads steeply into the forest across serpentine roads. For half an hour the trail winds through the forest downhill to Bukhta Soroshiya where a spring rises. The beach is good for camping as well. Several ways lead to Kurbulik. The best and shortest one can be found by following the driveway for about 100 m inland and then turning right for crossing the mountain. Two and a half hours later you will reach the fisher's village which is the only opportunity on the island to supply yourselves with food: At the second junction in the village you will find the bakery at the left corner. There is no sign and it is not always open. It is also a certain contingent of bread produced there. At the city limit there is a small shop were you can buy all kinds of stapled food. Right behind the shop starts the path towards the Snail Bay. After a short ascent it leads through the forest to Okunnaya Bay where you have a view over the small island Pakoiynski Kamyen. At the end of the bay, the trail leads for about 100 m through marshland which is a challenge concerning your sense of balance. If you're not sure about your capacity of balancing but want to keep your shoes dry, you better put them off before. Now the trail follows the up and down of the coast. Besides the steep coast, where you can enjoy panoramic views over the Tchivyrkuiy Bay and the Barguzin Mountains, picturesque sandy bays invite to stay for a while. All the time, the way is easily to find so that you will reach the Krestovskaya Bay after about 2 hours. From a beautiful and long beach with its numerous camping opportunities you can see the thermal springs at the opposite shore. You can also see the swimming hotel where you can stay for 1500 roubles full board (telephone: 3952 206811, www.rus.baikal.ru, rus@baikal.ru). The springs are located to the left. 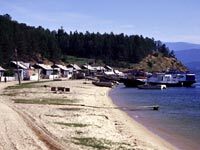 Besides the beautiful beach you can also enjoy a panoramic view over the Barguzin Mountains at the other shore of Lake Baikal, the Goliy and Lochmatiy Ostrof Islands, and the mountain range of Svatoy Nos. To go deeper into the Snail Bay, you have to walk to the end of the beach. There a path starts built by GreatBaikalTrail-volunteers. The vegetation of thick taiga is quite an interesting one. Even if you dont meet any asps you will understand by the fauna that surrounds you why this place needs to be protected. About three quarters of an hour later you will reach the Snails Bay where the trail leads over wooden boards and trunks across marshland. Now it is another 45 minutes till you will reach the hot springs. These springs consist of two simple wooden pools with water of 40 and 54° C degrees. Close to the springs there are no good opportunities for camping which makes it necessary to stay in the bay and just make a walk to the springs. In Kurbulik or Monachovo you can arrange for a pick-up from the springs or with a bit of luck you might find someone who will take you back spontaneously.